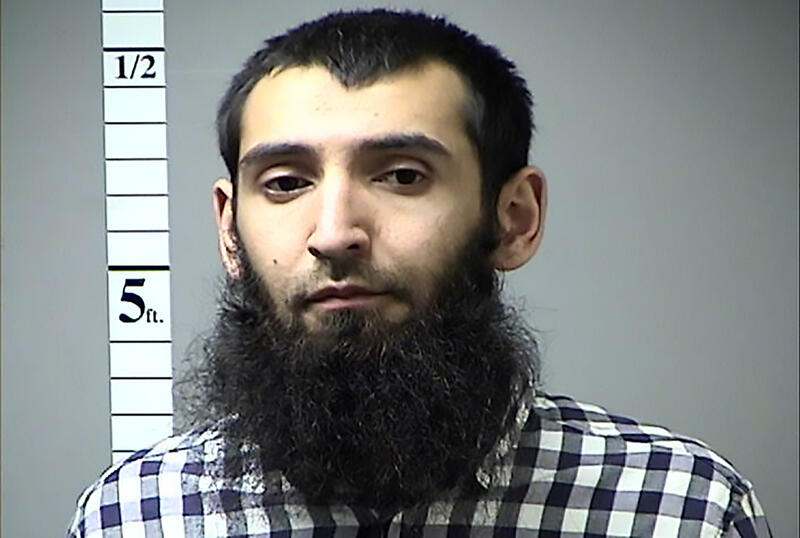 NEW YORK -- The man charged with murdering eight people on a New York City bike path and injuring many more spoke out in court Friday over a prosecutor's objection, invoking "Allah" and defending the Islamic State of Iraq and Syria (ISIS). Sayfullo Saipov, 30, raised his hand to speak immediately after U.S. District Judge Vernon S. Broderick set an Oct. 7, 2019 date for the Uzbek immigrant's trial. Speaking through an interpreter for about 10 minutes, Saipov said the decisions of a U.S. court were unimportant to him. He said he cared about "Allah" and the holy war being waged by ISIS. "I understand you, but I'm not worried about that at all," Saipov said. "So the Islamic State is not fighting for land, like some say, or like some say, for oil. They have one purpose, and they're fighting to impose Sharia (Islamic law) on earth," he said. After Saipov spoke more, Assistant U.S. Attorney Andrew Beaty interrupted him to object that the judge was letting Saipov make the kind of statement publicly that special restrictions placed on him in prison would otherwise prevent, including discussing "terrorist propaganda." The judge said he believed Saipov was nearing the end of his remarks and let him finish before warning him that he was unlikely to let him speak out in court again in a similar manner. Saipov, though, would be given a chance to testify if his case proceeds to trial and, if convicted, could speak at sentencing. Saipov thanked the judge for letting him speak but added at one point: "I don't accept this as my judge." Prosecutors had been seeking an April 2019 trial date. Houle said the families of the dead and the dozens who were injured deserve a "prompt and firm trial date." "The victims here are anxious now when that trial is going to be," she said. "The public deserves a speedy trial, and the surviving victims deserve to know when that trial is going to be." Defense lawyers have said the government should accept a guilty plea and a sentence of life in prison without parole to provide victims' families and the public with closure. David Patton, a lawyer for Saipov, said he would need extra time to make legal challenges to the charges if death is sought. He also cited the difficulty of gathering information for the defense case overseas and in the United States. A defense attorney said Saipov has had only telephone contact with his mother, father and sister since his arrest because they cannot get approval to travel to the United States. Prosecutors said those decisions were made by the State Department.